The perfect alchemy for your writing retreat. The sonance of the natural world. A zen-like ambience. The comfort and vibrance of organic food grown footsteps away. These are the elements that inspire a clear mind, open heart, and the willingness to channel inspiration. A peaceful setting is critical in facilitating deep thinking and growth. At Bliss Farm and Retreat, we enthusiastically create spaces and meals that nourish deep reflection and welcome creative energies. Our facilities include carefully decorated cabins, guest rooms, and common spaces for immersive group learning activities and soul work, in addition to extensive trails, lush gardens, and ample space to stretch, move, and unwind. 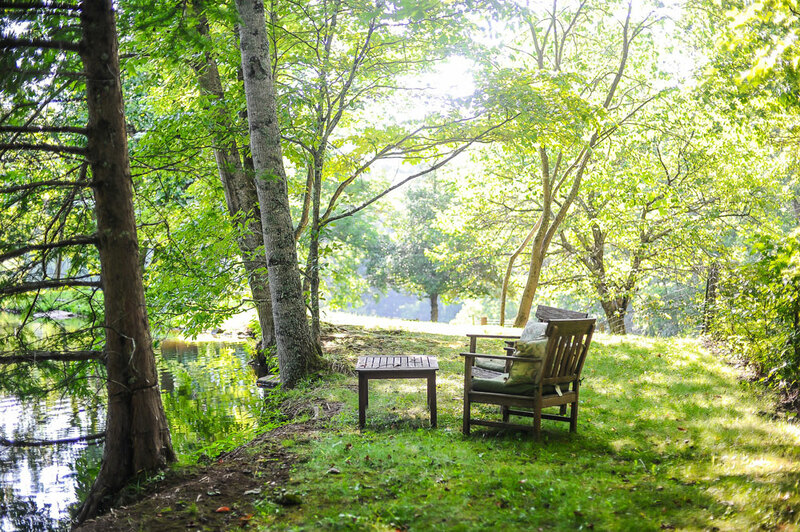 Our retreat center, located thirty minutes north of Asheville, is ideal for anyone planning a group retreat with a focus on writing, healing, meditation, and inner reflection. 2 large communal areas in the farmhouse and several outdoor gathering spaces, including a campfire area. Note: Indoor spaces do not have projectors, so are not ideal for corporate retreats. Retreat season is April to October, and we are now booking for the 2020 retreat season! Don’t miss our blog post featuring tips for planning the ultimate retreat. Ready to plan your writing retreat? Inquire here.